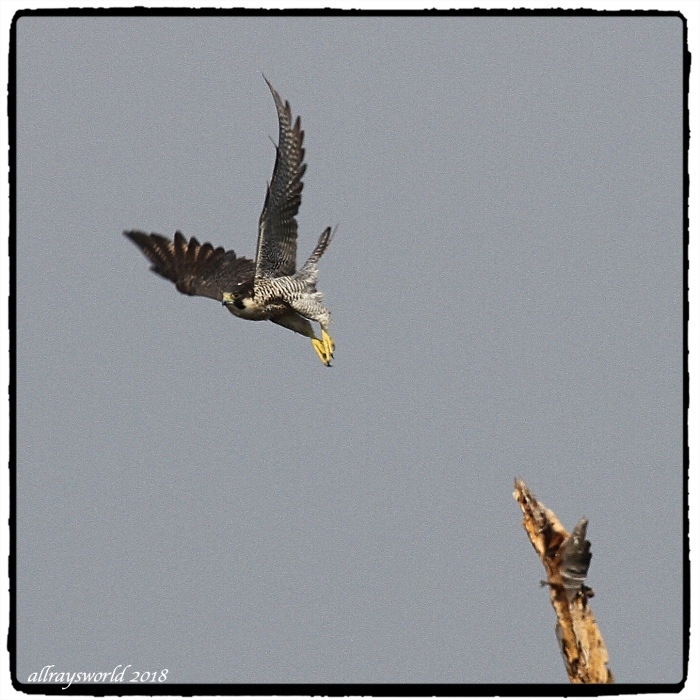 Near our house, a Peregrine Falcon...what a thrill! It is rather bigger than I expected, and very handsome. I suppose it enjoys hunting and eating the pigeons. Oooooh you lucky dog!!! And great shots of him, too! Ray: I am delighted to have come upon this gorgeous critter, Elizabeth. Ray: J'ai été heureux d'enregistrer ma première observation d'un Peregrine sauvage, Martine. Well done to catch him, Ray - and look at that all-seeing eye! Ray: They do have wonderful eyes, Lisl. Ray: I think so, Philine. They are fabulous birds and the fastest creature on the planet. I quite happy for them to eat every pigeon that they can. Ray: Peregrines are unlikely to die out through lack of pigeon snacks, Alan. Ray: Probably speaks a different language in Brexitland, Chris. Ray: A most elegant boid, Bill, and should have no problem finding pigeons to eat. Hum...quelle belle rencontre ...magique moment ! Ray: J'étais ravi de prendre ces photos, Claudine. Great isn’t it Ray, there’s always someone out to get you. Ray: I am reminded of that drawing of a fish being chased by a bigger fish which is being chased by an even bigger fish, Chad. We have them in Sheffield, nesting on an old church which is now a university lecture hall - http://peregrine.group.shef.ac.uk/ - occasionally visible now and in residence in the breeding season. Ray: Thank you for this information, Tom. I am still chuffed at finding this one so close to where we live. I would be thrilled to spot one too. Good one. Ray: It was too canny to let me get close, Mary, but I am quite pleased with these shots from about 200 metres away. As we sat by our French doors at the back of our house on Sunday afternoon there was an enormous bang on the glass, it was Sparrowhawk that had dived down and captured a Blackbird that had been just outside our window. Ray: I am guessing your hearts pounded for a while after this incident, Brian. Lucky you! Good shots Ray. Ray: The bird didn't let me closer than about 200 metres, Frank, so I was reasonably happy with what I did capture. Ray: In the past 2 years I have started noticing flocks of non-native pigeons eating grass/rice seeds in the fields around the village, Martin, so it is possible this Peregrine has followed them here.